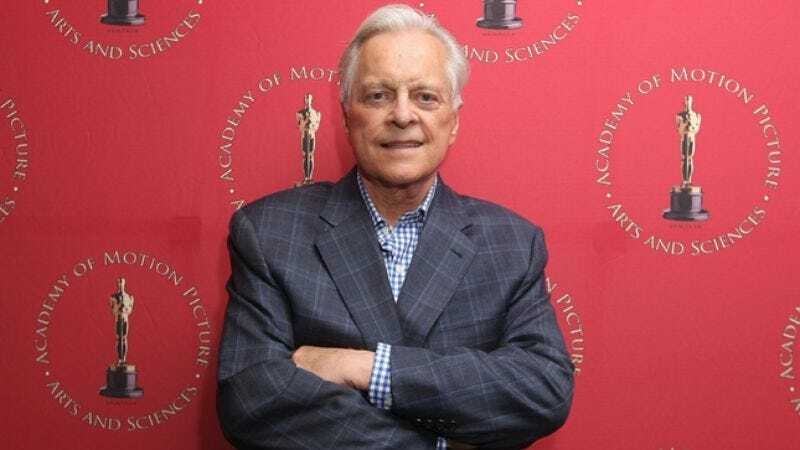 As a journalism student who dreamed of becoming a Hollywood actor, Turner Classic Movies host Robert Osborne landed in an ideal spot. He’s written several books about the Academy Awards, has covered Hollywood for newspapers and trade publications since the ’60s, and in his capacity as the face of TCM, Osborne has conducted interviews with just about every major star from the golden age of show business. In conjunction with TCM’s annual 31 Days Of Oscar festival—running from Feb. 1 through March 3—Osborne spoke with The A.V. Club about why he loves the Oscars, who he likes in this year’s race, and the rewards of spending nearly every waking hour thinking about and talking about movies. The A.V. Club: What’s the appeal of the Oscars to you? Robert Osborne: It’s the great endorsement of work being done in the movies. Not that we have that many great movies, but I believe we wouldn’t have as many as we do if there wasn’t an Oscar to shoot for. I think that no matter whether you’re Quentin Tarantino or any other kind of a rebel, or whatever, everyone who makes movies still wants to win an Academy Award, because it’s like the Pulitzer Prize or the Congressional Medal Of Honor. It’s the best endorsement you could get as a moviemaker. If they didn’t have an Oscar for people to shoot for, all they’d do is be making Dumb And Dumber again and again. AVC: Do you see some continuity in that from the early days of the Oscars to now? Has it always served as the impetus for people to do quality work? AVC: Do you keep a list in your head of some of the most egregious Oscar mistakes? Like a worst Best Picture winner? RO: Somebody, I think it was Pauline Kael, called Around The World In Eighty Days the worst Best Picture, and y’know, I’d like to slap her silly for that. It’s very hard to judge, because it may look like a mistake to you today, judging from 2010 while watching it on TCM or whatever, but at the time it meant something totally different. In the case of Around The World In Eighty Days, that’s a movie that truly has to be seen on a big screen, preferably in Todd-AO and all of that. Because when I saw that in those conditions, it was a fabulous movie. Also, at the time it came out, 1956, it was a movie in which all the supporting players were played by very famous people: Noel Coward, John Gielgud, Edmund Lowe, Beatrice Lillie, Glynis Johns, Evelyn Keyes, Hermione Gingold. All those people were in that movie. Today, a lot of audiences don’t recognize them, so for them, they’re just characters. But all of it, particularly the big-screen projection and all that, made the movie such an experience, a magical experience, and that doesn’t exist today if you’re watching it on television or if you’re 25 years old and don’t have any idea who those people are in the movie. AVC: How about for this year? Who are your favorites for 2010? RO: Well, I certainly like Colin Firth in The King’s Speech, and Geoffrey Rush. Melissa Leo in The Fighter… oh, boy. Mark Wahlberg in The Fighter, Julianne Moore and Annette Bening in The Kids Are All Right. There’s been an awful lot of good work. My problem with the movies this year is that there are very few that make me feel like I really wanted to leave the house and pay 10 bucks. I felt that way about The Social Network. I couldn’t wait to see that. But not many other movies. Whereas I must say that a lot of movies that we’re showing on TCM this month, I kind of can’t wait to come on so I can watch them again. Because I think one thing that always attracted me to movies was the personalities. I went to movies not because the stories necessarily appealed to me, but because of the people in them. There are not that many people in the movies today that really make me go out and buy a movie ticket. AVC: How much input do you have into TCM’s programming? RO: Charlie Tabesh, who’s the VP in charge of programming, is very generous and lets me input quite often. Luckily, I don’t have to do a full schedule, because that’s a full-time job in itself. A wonderful fellow does that, and Charlie oversees it. But there are times when I really love having some input, particularly in August when we have our Summer Under The Stars festival, and he’ll let me look at the list of films and do some of the scheduling myself so that what I think are definitive films of a certain actor are shown in prime-time hours as opposed to 10 in the morning or 4 in the morning. He’s very good about that, not being territorial. AVC: Would you say you’ve seen the vast majority of TCM’s library? RO: I’ve seen, yeah, kind of a frightening amount. I have to re-see some sometimes. I just did another session with Alec Baldwin for our Essentials franchise, and there were a lot of films that we were showing that I hadn’t seen in a long, long time: East Of Eden, Splendor In The Grass, Dr. Strangelove, and others. It had been quite a while since I’d seen them. Since I had to talk to him about them in detail, I really had to see them again. I’m either always watching movies or reading about them. It’s what I’d be doing as a hobby if I wasn’t doing it for my profession, so I really don’t mind. AVC: How much you learn from the guest programmers? RO: I love to find out why people go to certain movies. And what I particularly like is when we have a guest programmer who will pick a movie that’s not that well known, and therefore may introduce it to our viewers for the first time. If somebody comes on like Donald Trump did and picks Gone With The Wind and Citizen Kane, you say, “Yeah, those are great movies, but everybody knows those already.” What I like is when somebody will come on and pick a movie that they saw once when they were a child, or that’s a very special movie to them, or that they feel is like a discovery of theirs. And then they share that with somebody else. Then I think it’s great fun, because they’re really doing a service to filmgoers. AVC: Is there anyone who surprised you, whose knowledge of movies was much greater than you’d expected? RO: Well, two people, Whoopi Goldberg and Sally Field. They were both enormously, like Alec, savvy about films and had a great take. I thought, “Wow, this is great.” That was a total pleasure, because they really were thoughtful about films and knew a lot. AVC: TCM shows movies uncut and has done special programs on gay cinema and various minority viewpoints in cinema. Do you ever get any pushback from viewers or cable providers about content, either because it’s too risqué or too political? RO: I’m not aware of any. I don’t read our website things, but there probably are people on there who might complain. People will happily complain about anything, but I’m not sure how serious it is. We showed The Birth Of A Nation, which is such a controversial film and so blatantly racist, but it is The Birth Of A Nation, and we were showing it in context as a landmark in filmmaking, because of when it was made, 1915, and the way it tells a story, as the first big epic. So the first time we showed it we had various people come on before and during the movie, to talk about its place in history. Some African-American film professors. We expected maybe outrage that we showed it, because it’s so demeaning to blacks, that movie. But we didn’t really get any, and I think it’s because people are getting smarter about that kind of stuff and realizing that was the way it was then, but that doesn’t mean that’s the way it is now. Whereas early on I think we used to get some squawk whenever we’d show a movie that Mickey Rooney and Judy Garland did which has a musical number in blackface. Some people used to write and say, “How did you dare show that? That’s so awful.” I think now people realize that we don’t cut our movies, and that’s the way those movies were made and what was acceptable to people at one time. But we’re not saying that’s what is acceptable to people now. AVC: Do you have a favorite decade of cinema? RO: Kind of the ’40s, yeah. I like things in the ’30s, but you know, the sound recording in the ’30s wasn’t very good. But for some reason the movies in the ’40s have the best personalities: Jimmy Stewart, Gary Cooper, Betty Grable, Gene Tierney, and all those people. For some reason, I seem to gravitate more toward the ’40s, and I don’t necessarily know why. I just love the people.